Senator Ben Cardin clarifies that new bills targeting BDS would impose fines on participating businesses but not criminal penalties. 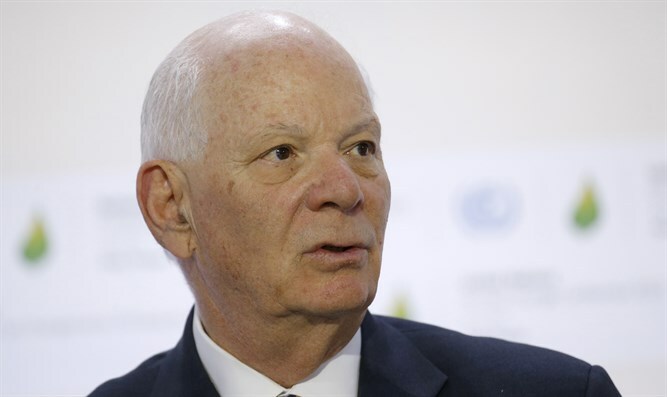 Senator Ben Cardin (D-MD) clarified on Thursday that bipartisan bills targeting the Boycott, Divestment and Sanctions (BDS) movement against Israel would impose fines on participating businesses but not criminal penalties, JTA reports. Measures introduced in recent weeks in the U.S. Senate by Cardin and Senator Rob Portman (R-OH), and in the U.S. House of Representatives by Reps. Pete Roskam (R-IL), and Juan Vargas (D-CA), would extend penalties in 1970s-era bills that targeted businesses that cooperated with the Arab League boycott of Israel. Those laws included fines and criminal penalties. Cardin’s office, responding to a request from JTA to clarify whether the criminal penalties would apply to those observing BDS boycotts, explained that only certain fines in existing law would be applied to BDS-observant businesses, not the criminal penalties. The senator's spokesman told the news agency that the main spur for the legislation was to extend anti-boycott laws to international governmental organizations in the wake of a move earlier this year by the UN Human Rights Council to create a list of businesses doing business with Israeli communities in Judea and Samaria. The bill would expand the anti-boycott legislation to protect not just Israel but also the communities in Judea and Samaria. It also expands the definition of boycotts to include those that are "politically motivated." Even confined to penalties, the legislation would go well beyond current state and federal anti-BDS statutes, which mostly require government agencies to refuse to do business with BDS-compliant companies. Fining businesses simply for boycotting Israel could face First Amendment objections, noted JTA. The House and Senate bills follow law passed by several American states against BDS. In late September, California Governor Jerry Brown signed into law a measure that prevents companies that boycott or discriminate against any sovereign country, including Israel, from doing business with the state. In August, New Jersey Governor Chris Christie adopted an anti-BDS bill prohibiting pension fund investment in entities that call for a boycott of Israel, and mandates a special report which will be presented to the State’s legislators to guarantee that the bill is being implemented. In June, New York’s Governor Andrew Cuomo signed an executive order banning state companies from collaborating with entities that promote BDS. Other states to have passed similar laws are Arizona, Indiana, Florida, Tennessee and Virginia.